by Chris Woodford. Last updated: November 26, 2018. Stop... start... stop... start—it's no way to drive! Every time you slow down or stop a vehicle or machine, you waste the momentum it's built up beforehand, turning its kinetic energy (energy of movement) into heat energy in the brakes. Wouldn't it be better if you could somehow store that energy when you stopped and get it back again the next time you started up? That's one of the jobs that a flywheel can do for you. First used in potters wheels, then hugely popular in giant engines and machines during the Industrial Revolution, flywheels are now making a comeback in everything from buses and trains to race cars and power plants. Let's take a closer look at how they work! 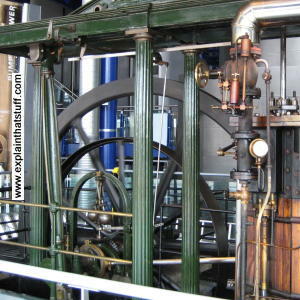 Photo: An old flywheel on a steam engine at Think Tank, the science and industry museum in Birmingham, England. The flywheel is the wheel with spokes at the back. Notice how it's mostly empty space with long spokes and a large, heavy rim. Engines are happiest and at their most efficient when they're producing power at a constant, relatively high speed. The only trouble is, the vehicles and machines they drive need to operate at all kinds of different speeds and sometimes need to stop altogether. Clutches and gears partly solve this problem. (A clutch is a mechanical "switch" that can disengage an engine from the machine it's driving, while a gear is a pair of interlocked wheels with teeth that changes the speed and torque (turning force) of a machine, so it can go faster or slower even when the engine goes at the same speed.) But what clutches and gears can't do is save the energy you waste when you brake and give it back again later. That's a job for a flywheel! Photo: A typical flywheel on a gas-pumping engine. The flywheel is the larger of the two black wheels with the heavy black rim in the center. This is one of many fascinating engines you can see at Think Tank, the science museum in Birmingham, England. A flywheel is essentially a very heavy wheel that takes a lot of force to spin around. It might be a large-diameter wheel with spokes and a very heavy metal rim, or it could be a smaller-diameter cylinder made of something like a carbon-fiber composite. Either way, it's the kind of wheel you have to push really hard to set it spinning. Just as a flywheel needs lots of force to start it off, so it needs a lot of force to make it stop. As a result, when it's spinning at high speed, it tends to want to keep on spinning (we say it has a lot of angular momentum), which means it can store a great deal of kinetic energy. You can think of it as a kind of "mechanical battery," but it's storing energy in the form of movement (kinetic energy, in other words) rather than the energy stored in chemical form inside a traditional, electrical battery. Flywheels come in all shapes and sizes. The laws of physics (explained briefly in the box below—but you can skip them if you're not interested or you know about them already) tell us that large diameter and heavy wheels store more energy than smaller and lighter wheels, while flywheels that spin faster store much more energy than ones that spin slower. Modern flywheels are a bit different from the ones that were popular during the Industrial Revolution. Instead of wide and heavy steel wheels with even heavier steel rims, 21st-century flywheels tend to be more compact and made from carbon-fiber or composite materials, sometimes with steel rims, which work out perhaps a quarter as heavy. Things moving in a straight line have momentum (a kind of "power" of motion) and kinetic energy (the energy they have because of their movement) because of their mass (how much "stuff" they contain) and their velocity (how fast they're going). In the same way, rotating objects have kinetic energy because they have what's called a moment of inertia (how much "stuff" they're made from and how it's distributed) and an angular velocity (how fast they're rotating). Moment of inertia is the equivalent of mass for spinning objects, while angular velocity is like ordinary velocity only going round in a circle. (where I is the moment of inertia and ω is the angular velocity). "Moment of inertia" sounds horribly abstract and confusing, but it's much easier to understand than you might think. What it really means is that, from the viewpoint of kinetic energy and momentum, the effective mass of a spinning object depends not just on how much actual mass it has but on where that mass is located in relation to the point it's spinning around. The further from the center the mass is, the more effect it has on the object's momentum and kinetic energy—and we quantify that by saying the mass has a higher moment of inertia. So a large diameter, lightweight, spoked flywheel with a very heavy steel rim might have a higher moment of inertia than a much smaller, solid flywheel, because more of its mass is further from the point of rotation. The laws of conservation of energy and conservation of momentum apply to spinning objects just as they apply to objects speeding in straight lines. So something that spins with a certain amount of energy and angular momentum (the spinning equivalent of ordinary, straight-line, linear momentum) keeps its angular momentum unless a force (such as friction or air resistance) steals it away. This law is called the conservation of angular momentum. When a figure skater puts their arms out, some of their mass is further from the center of their body (the point of rotation) so they have a higher moment of inertia. If they're spinning quickly with their arms out but then suddenly bring their arms in to the center, they instantly reduce their moment of inertia. But the conservation of angular momentum says their total angular momentum must stay the same—and the only way that can happen is if they speed up. That's why a spinning figure skater will spin faster when they bring their arms in to their body (and slow down when they put their arms out again). What's the best design for a flywheel? The force on a flywheel increases with speed, and the energy a wheel can store is limited by the strength of the material from which it's made: spin a flywheel too fast and you'll eventually reach a point where the force is so great that it shatters the wheel into fragments. Strong, lightweight materials turn out to be the best for flywheels since they can spin fastest without breaking apart. Modern flywheels are typically constructed from materials such as alloys, carbon-fiber composites, ceramics, and crystalline materials such as single crystals of silicon. Some are specifically designed to shatter safely into tiny fragments if they spin too fast. Artworks: Flywheels have a fixed diameter and mass, and therefore a fixed moment of inertia—or do they? This ingenious 1959 flywheel system designed by Bertram Schmidt can fold in and out to increase or decrease the energy it stores. How does it work? The driving motor (green, right) powers the load (orange, left) through an axle (yellow) and pulley system (gray). As the speed of the axle changes, a centrifugal governor (dark blue) and electric circuit (top right) switch a small electric motor (pink) on or off, moving a linkage (brown) to the left or right, moving another linkage (blue), so the flywheel (red) folds in or out as necessary. 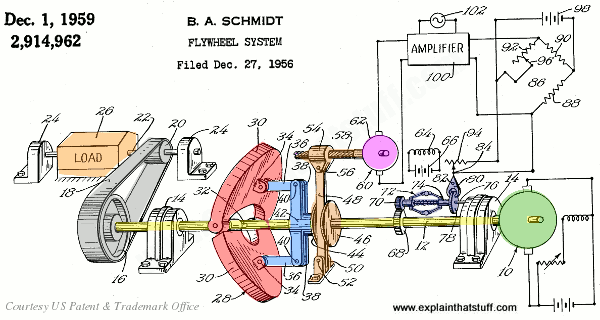 From US Patent 2,914,962: Flywheel system by Bertram Schmidt, published December 1, 1959, courtesy US Patent and Trademark Office. How can a flywheel retain its energy? Photo: Flywheels eventually stop turning due to friction and air resistance, but if we mount them on very low friction bearings, they'll retain their energy for days at a time. This experimental flywheel uses a frictionless superconducting bearing and spins inside a vacuum chamber to prevent air resistance from slowing it down. Photo courtesy of US Department of Energy/Argonne National Laboratory. The laws of physics (Newton's first law of motion, to be exact) tell us that a moving object will tend to keep moving unless a force acts on it. So you might think a flywheel would keep spinning forever. The only trouble is, flywheels spin on bearings so, even when they're well lubricated, the force of friction slows them down. There's another problem too: as flywheels spin through the air, air resistance or drag slows them down as well. Modern flywheels get around these problems by being mounted on low-friction bearings and sealed inside metal cylinders so they don't lose as much energy to friction and air resistance as traditional flywheels would have done. The most sophisticated flywheels float on superconducting magnets (so they spin almost entirely without friction) and are sealed inside vacuum chambers (so there are no losses to air resistance). 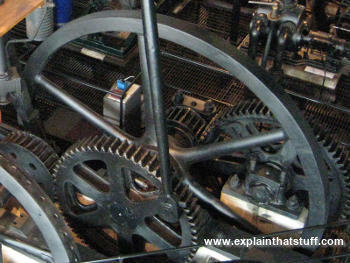 Photo: A typical modern flywheel doesn't even look like a wheel! It consists of a spinning carbon-fiber cylinder mounted inside a very sturdy container, which is designed to stop any high-speed fragments if the rotor should break. Flywheels like this have an electric motor and/or generator attached, which stores the energy in the wheel and gets it back again later when it's needed. 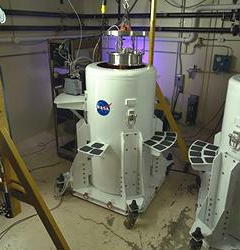 Photo courtesy of NASA Glenn Research Center (NASA-GRC). Consider something like an old-fashioned steam traction engine—essentially a heavy old tractor powered by a steam engine that runs on the road instead of on rails. Let's say we have a traction engine with a large flywheel that sits between the engine producing the power and the wheels that are taking that power and moving the engine down the road. Further, let's suppose the flywheel has clutches so it can be connected or disconnected from either the steam engine, the driving wheels, or both. The flywheel can do three very useful jobs for us. First, if the steam engine produces power intermittently (maybe because it has only one cylinder), the flywheel helps to smooth out the power the wheels receive. So while the engine's cylinder might add power to the flywheel every thirty seconds (every time the piston pushes out from the cylinder), the wheels could take power from the flywheel at steady, continual rate—and the engine would roll smoothly instead of jerking along in fits and starts (as it might if it were powered directly by the piston and cylinder). Second, the flywheel can be used to slow down the vehicle, like a brake—but a brake that soaks up the vehicle's energy instead of wasting it like a normal brake. Suppose you're driving a traction engine down a street and you suddenly want to stop. You could disengage the steam engine with the clutch so that the vehicle would start to slow down. As it did so, energy would be transferred from the vehicle to the flywheel, which would pick up speed and keep spinning. You could then disengage the flywheel to make the vehicle stop completely. Next time you set off again, you'd use the clutch to reconnect the flywheel to the driving wheels, so the flywheel would give back much of the engine it absorbed during braking. Third, a flywheel can be used to provide temporary extra power when the engine can't produce enough. Suppose you want to overtake a slow-moving horse and cart. Let's say the flywheel has been spinning for some time but isn't currently connected to either the engine or the wheels. When you reconnect it to the wheels, it's like a second engine that provides extra power. It only works temporarily, however, because the energy you feed to the wheels must be lost from the flywheel, causing it to slow down. You could argue that flywheels are among the oldest of inventions: the earliest wheels were made of heavy stone or solid wood and, because they had a high moment of inertia, worked like flywheels whether they were intended to or not. The potter's wheel (perhaps the oldest form of wheel in existence—even older than the wheels used in transportation) relies on its turntable being solid and heavy (or having a heavy rim), so it has a high moment of inertia that keeps it spinning all by itself while you shape the clay on top with your hands. Water wheels, which make power from rivers and creeks, are also designed like flywheels, with strong but light spokes and very heavy rims, so they keep on turning at a constant rate and powering mills at a steady speed. Water wheels like this became popular from Roman times onward. Photo: Water wheels use the simple flywheel principle to keep themselves spinning at a steady speed. 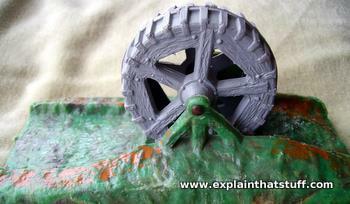 This is a model of an undershot water wheel (one powered by a river flowing underneath). The best known flywheels date from the Industrial Revolution and are used in things like factory steam engines and traction engines. Look closely at almost any factory machine from the 18th or 19th century and you'll see a huge flywheel somewhere in the mechanism. Since flywheels are often very large and spin at high speeds, their heavy rims have to withstand extreme forces. They also have to be precision made since, if they're even slightly unbalanced, they will wobble too much and destabilize whatever they're attached to. The widespread availability of iron and steel during the Industrial Revolution made it possible to engineer well-made, high precision flywheels, which played a vital role in ensuring that engines and machines could operate smoothly and efficiently. Following the work of 19th-century electrical pioneers like Thomas Edison, electric power was soon widely available for driving factory machines, which no longer needed flywheels to smooth erratic, coal-powered steam engines. Meanwhile, road vehicles, ships, trains, and airplanes were using internal combustion engines powered by gasoline, diesel, and kerosene. Flywheels were generally large and heavy and had no place inside something like a car engine or a ship, let alone an airplane. As a result, flywheel technology fell somewhat by the wayside as the 20th century progressed. Since the mid-20th century, interest in flywheels has picked up again, largely because people have become more concerned about the price of fuels and the environmental impact of using them; it makes sense to save energy—and flywheels are very good at doing that. Since about the 1950s, European bus makers such as M.A.N. and Mercedes-Benz have been experimenting with flywheel technology in vehicles known as gyrobuses. The basic idea is to mount a heavy steel flywheel (about 60cm or a couple of feet in diameter, spinning at about 10,000 rpm) between the rear engine of the bus and the rear axle, so it acts as a bridge between the engine and the wheels. Whenever the bus brakes, the flywheel works as a regenerative brake, absorbing kinetic energy and slowing the vehicle down. When the bus starts up again, the flywheel returns its energy to the transmission, saving much of the braking energy that would otherwise have been wasted. Modern railroad and subway trains also make widespread use of regenerative, flywheel brakes, which can give a total energy saving of perhaps a third or more. Some electric car makers have proposed using super-fast spinning flywheels as energy storage devices instead of batteries. One of the big advantages of this would be that flywheels could potentially last for the entire life of a car, unlike batteries, which are likely to need very expensive replacement after perhaps a decade or so. 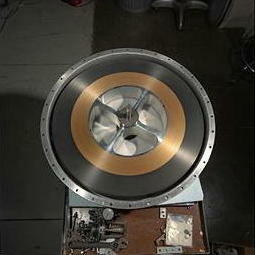 Photo: A modern flywheel developed by NASA for use in space. Note how the silver-colored center of the wheel is mostly empty space and spokes, while the mass of the wheel is concentrated around the rim. This gives the wheel what's known as a high moment of inertia (explained in more detail below) and allows it to store more energy. Photo by courtesy of NASA Glenn Research Center (NASA-GRC). Just as flywheels—in the form of waterwheels—played an important part in human efforts to harness energy, so they're making a comeback in modern electricity production. One of the difficulties with power plants (and even more so with forms of renewable energy such as wind and solar power) is that they don't necessarily produce electricity constantly, or in a way that precisely matches the rise and fall in demand over the course of a day. A related problem is that it's much easier to make electricity than it is to store it in large quantities. Flywheels offer a solution to this. At times when there is more electricity supply than demand (such as during the night or on the weekend), power plants can feed their excess energy into huge flywheels, which will store it for periods ranging from minutes to hours and release it again at times of peak need. At three plants in New York, Massachusetts, and Pennsylvania, Beacon Power has pioneered using flywheels to provide up to 20 megawatts of power storage to meet temporary peaks in demand. They're also used in places like computer data centers to provide emergency, backup power in case of outages. Flywheels are relatively simple technology with lots of plus points compared to rivals such as rechargeable batteries: in terms of initial cost and ongoing maintenance, they work out cheaper, last about 10 times longer (there are still many working flywheels in operation dating from the Industrial Revolution), are environmentally friendly (produce no carbon dioxide emissions and contain no hazardous chemicals that cause pollution), work in almost any climate, and are very quick to get up to speed (unlike batteries, for example, which can take many hours to charge). They're also extremely efficient (maybe 80 percent or more) and take up less space than batteries or other forms of energy storage (like pumped water storage reservoirs). The biggest disadvantage of flywheels (certainly so far as vehicles are concerned) is the weight they add. A complete Formula 1 KERS flywheel system (including the container, hydraulics, and electronic control systems it needs) about 25kg to the car's weight, which is a significant extra load. Another problem (particulary for Formula 1 drivers) is that a large, heavy wheel spinning inside a moving car will tend to act like a gyroscope, resisting changes in its direction and potentially affecting the handling of the vehicle (although there are various solutions, including mounting flywheels on gimbals like a ship's compass). A further difficulty is the huge stresses and strains that flywheels experience when they rotate at extremely high speeds, which can cause them to shatter and explode into fragments. This acts as a limit on how fast flywheels can spin and, consequently, how much energy they can store. While traditional wheels were made from steel and spun around in the open air, modern ones are more likely to use high-performance composites or ceramics and be sealed inside containers, making higher speeds and energies possible without compromising on safety. Flywheels Get Their Spin Back With Beacon Power's Rebound by Peter Fairley. IEEE Spectrum, December 24, 2014. The fall and rise of Beacon Power and its competitors in cutting-edge flywheel energy storage. Advancing the Flywheel for Energy Storage and Grid Regulation by Matthew L. Wald. The New York Times (Green Blog), January 25, 2010. Another brief look at Beacon Power's flywheel electricity storage system in Stephentown, New York. Flywheel Batteries Come Around Again by Robert Hebner and Joseph Beno. IEEE Spectrum, April 1, 2002. Electronic components, as well as mechanical ones, set the limit to what flywheels can do. The promise and perils of flywheels by Mariette DiChristina. Popular Science, June 1994, p.99. Interesting boxed feature in an article about future car technologies. Flywheels: New Boost for Engine Power by Richard F. Dempewolff. Popular Mechanics, February 1978. Examines how flywheels improve engine efficiency in ordinary cars. Flywheel Technology: Past, Present, and 21st Century Projections by J Bitterly. IEEE Aerospace and Electronics Systems Magazine, 1998;13:13–6. A general review of flywheel technology. Flywheel energy and power storage systems by Björn Bolund, Hans Bernhoff, and Mats Leijon. Renewable and Sustainable Energy Reviews, 11 (2007), 235–258. Considers how flywheels can be used for electricity storage. There are dozens of patents covering flywheels of one kind or another, from early gyroscopes to modern KERS systems; here are just a handful to kick-start your research. Try looking on Google Patents for more—or following the "prior art" links in one patent back to the earlier inventions it draws on. US Patent 4,821,599: Energy storage flywheel by Philip A. C. Medlicott, British Petroleum Company PLC, April 18, 1989. This goes into some detail about the design, manufacture, and materials used in a flywheel. US Patent 4,244,240: Elastic internal flywheel gimbal by David W. Rabenhorst, The Johns Hopkins University, January 13, 1981. A gimbal-mounted flywheel for reduced vibration. US Patent 5,614,777: Flywheel based energy storage system by Jack Bitterly et al, US Flywheel Systems, March 25, 1997. 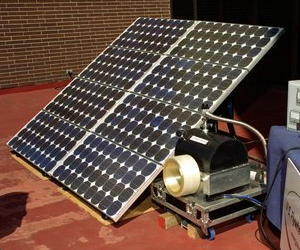 A compact vehicle flywheel system designed to minimize energy losses. US Patent 6,388,347: Flywheel battery system with active counter-rotating containment by H. Wayland Blake et al, Trinity Flywheel Power, May 14, 2002. 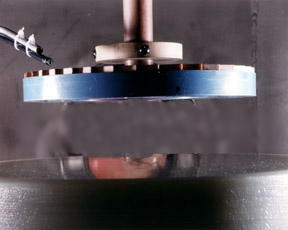 A counter-rotating flywheel unit that minimizes gyroscopic effects (an important consideration in applications such as space satellites). US Patent 8,314,527: Advanced flywheel and method by JimPo Wang, Beacon Power, November 20, 2012. Explains the technology behind Beacon's power plant flywheel storage system. US Patent 8,761,984: Front wheel energy recovery system by William M. Yates et al, W.Morrison Consulting Group Inc., June 14, 2014. Describes a KERS system for a motorbike.